my little princess (see her headband of power? LOL) is a chatterbox and a powerhouse of energy. she loves her markers and sketch pads better than any of her dolls (any new doll is her favorite for a maximum of 24 hours. after that, the doll is pushed into her ever-growing bin of stuffed animals and dolls.) she's a highly verbal child that picks up words very very quickly even if it's in chinese, french, or tagalog. 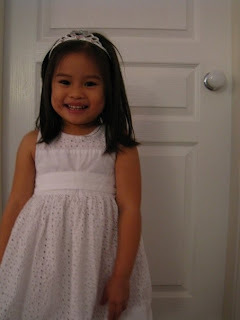 she can count and sing a few songs in chinese (they are taught in her preschool daycare), knows the days of the week and count in french, and knows several tagalog words. it's all but why do they have to grow up so fast?! when i was pregnant with amori i wasn't as obsessed with shopping for her - i think her grandma took care of that part fairly well. it was aldo that did the research on strollers and car seats while i did the bottles, sterilizer, toys, and slings. i think i was too preoccupied (and scared) with the thought of childbirth to fuss about baby gear. this time, however, i think i'm making up for it. i've gone crazy! 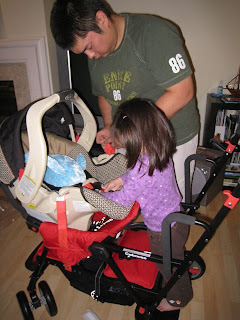 reading up on reviews on strollers kept me busy for a good 3 weeks, and since i (think) know what i'll really be needing and how long i'll be using stuff for, i've kept myself hooked up via twitter, emails, and forums to know when particular things are on sale so i can get them at the best price. we're also lucky that this time around, friends have lent us their infant car seat. since it'll only be used for the first 5 or 6 months, we were ok with using a borrowed one. the Britax Marathon can actually hold an infant but for convenience, we're using the infant car seat first - it's way easier to get in and out of the car. we also picked up Amori and Baby #2's new ride: the Joovy Caboose Ultralight. 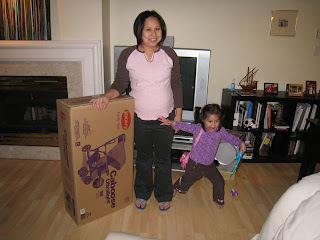 i had already convinced myself that the original Caboose was all i needed but since i'm not exactly the strongest mama in the whole world, aldo convinced me that the ultralight would be easier for me to use since i'll be the one lifting that thing in and out of the car. good thing it was on sale too, but the $100 difference still haunts me. we were pretty lucky that the sales associate that was helping us out told us that there was a special edition that wasn't on display. instead of a silver frame, the special edition has a black frame, plus an all-weather pad that we can attach to the seat once Baby #2 is out of the car seat. the only big-ticket item left on the list is a crib mattress since Amori is still using hers in a toddler bed. she'll eventually have a big bed but she's still ok in her toddler bed so there's no use panic-buying... although i have to admit, i entertained the thought of buying her a bed when there was a sale at Sears. but Aldo was right, we can wait another year, or til we move to another place. next on the shopping list is a post-partum binder for me. been reading up on it and am convinced i need one because when i was recovering from my previous c-section, i had real trouble standing up because i felt my guts were going to spill out, which resulted to bad backache and a miserable me. had i known there are such things as binders, i would have gotten one. since i know i'll be having a c-section again, hopefully a binder will help me feel a little less miserable. i've seen the Abdomend Bikini Belt that looks comfortable, or the widely-marketed Belly Bandit. both are ridiculously expensive though so i'm still thinking twice. i wonder if the lesser-expensive binder at Motherhood works as well.. i hope it does because i don't want to cough up $80 for the Belly Bandit or $100 for the Abdomend Bikini Belt! 30 weeks down, 8 to go (or whenever they book my c-section)!